As much as I loved Australia, it was time to say goodbye for a while. It was an incredible 6 months that will be in my heart for a long, long time, and I hope to return one day. A turn of events has found me home in Seattle for a brief two weeks, coming up with a new last minute 2014-oh-my-god-I’m-turning-30-adventure. On January 1st, 2014, I’ll be landing in Santiago, Chile, where I’ll buy a motorcycle and ride to Patagonia and wherever else the wind blows me. This isn’t exactly the Mongolia to Europe overland trip I had in the works for this June, but life is unpredictable and if you don’t have cat-like reflexes, you’ll land on your face. When life throws you a curve ball… You go buy a motorcycle in a foreign country. Right?? Maybe this trip will show people that you don’t need to spend a year planning and agonizing over the details of an adventure motorcycle ride, at least in a continent that doesn’t require Carnets. No shipping your passport off or dealing with expensive paperwork beforehand, no need to save zillions of dollars, and no need to bring your fancy BMW12,000,000. Just peruse Horizons Unlimited for a bit, buy your ticket, get a cheap bike, and off you go. And if you don’t believe me… Well, just watch this site and maybe I’ll prove myself right. Or wrong. Either way, it’ll be an adventure, and TravelBug loves a good adventure. 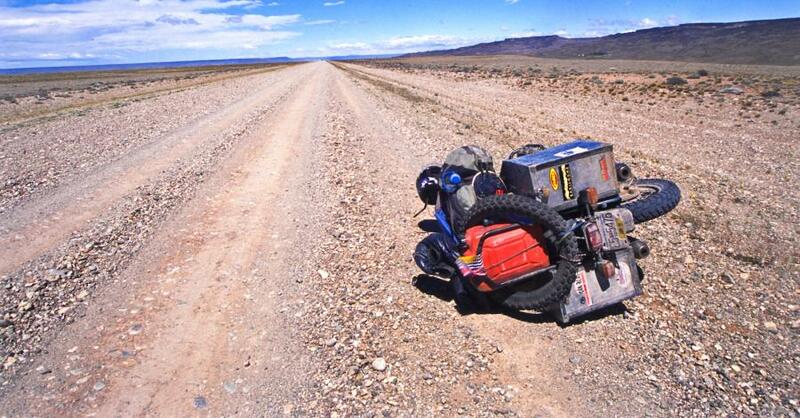 And what better way to survive life’s curve balls than touring South America on a 125cc mini motorbike? Thanks for the picture, Internet. This’ll be me soon enough! Yes, sunblock, tons! Punta Arenas in the South of Chile is the city that receives the most of the ultraviolent radiation due to the ozone hole in the area. I wish the hole would move a little bit to the East so they can cook the British living in our Malvinas! Hi Alisa, just got back from the overland track. Tassie is a great beauty. Surprised to see you on another track so soon. Thanks a lot for the pack cover. It has been very useful. It almost rained every day. When are you coming back to Australia? Wait for me… I’ll bring my Postie in my hand luggage. Finally going on my own european motorcycle adventure :). I’m assuming you checked a bag in when you flew into Santiago. What did you do with it when you got there? Was it the roll-up backpack or duffel bag? Good for you! As for my bags, I went to the thrift store the day before I flew to Santiago and bought a big cheap duffel-like bag for $2 bucks. Just threw it away at the Santiago airport (partially because the baggage claim ate parts of it! ).